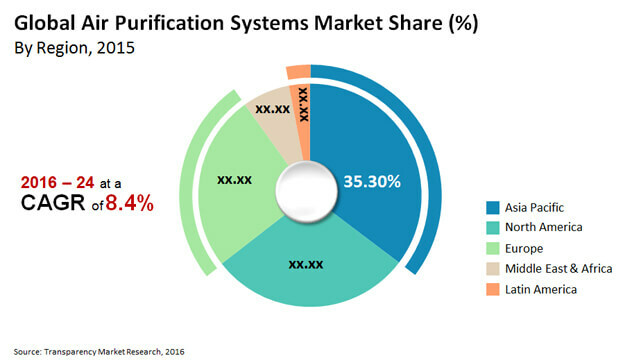 The global air purification systems market is predicted to be open and accessible while also being dominated by a significant count of international and local players, find research analysts. One of the critical supplier powers penned by the analysts is making available customized components and materials. Acquisition is still rated as a pronounced strategy to latch on to a strong position in the market. In 2016, Sweden-based player Blueair was acquired by Unilever, an FMCG giant, to start business in the air purification sector. Some of the top-tier manufacturers functioning in the market are Camfil Group, LG Electronics, Honeywell International Inc., Sharp Corporation, and Daikin Industries Ltd.
During the course of the forecast period 2016–2024, the world air purification systems market is prognosticated to register a decent CAGR of 8.4%. The market is envisaged to rake in a revenue growth of US$24.83 bn by the concluding year of the forecast period. For 2016, the revenue forecast had recorded the ballpark figure of US$13.06 bn. Asia Pacific is anticipated to attract a lavish growth in demand owing to the deterioration of air quality and increase in environmental issues. As a result of which, the region is expected to grasp a mammoth share of 39.1% by 2024. On account of its great efficiency related to the eradication of contaminants, the high-efficiency particulate air (HEPA) purifier technology is foretold to take the lead with a US$10.06 bn share in 2024. China and India are projected to showcase a burgeoning demand for air purification systems as the indoor air quality (IAQ) keeps decreasing at a disturbing rate. Approximately 80.0% of health problems due to air pollution are recorded in emerging nations, particularly those of Asia Pacific. This is likely to help the air purification systems market further its growth in developing regions. The soaring awareness among the consumers of air purification systems could stimulate the demand in the global market even more. There is a rising need to purify the air around residential and commercial areas to keep away hazardous health issues such as allergic respiratory disorders, bronchitis, throat irritation, chronic asthma, and burning sensation in the eyes. Since urbanization and industrialization are studied to affect air quality in some way or the other, the ballooning elevation in the population size of developing regions is predicted to set the tone for the air purification systems market. By 2025, the population in the cities of developing markets is foreseen to rise to around 2.6 bn. The green adoption of air purifiers has inflated the demand for eco-friendly products in the air purification systems market. Ozone is crucial for life on earth. However, ozone is only beneficial when it stays high in the atmosphere and not on ground. This is because of its nature to cause disorders such as chest discomfort, throat irritation, and lung irritation. Ionic systems generating ozone as a by-product could hit the air purification systems market to no good. Besides this, the high prices of products owing to costs incurred by companies on the part of research and development could dwindle the market growth further. However, players can concentrate on fertile markets such as Asia Pacific that are all set to offer quick and healthy sales. Supported by government initiatives, Asia Pacific could aggravate demand with rising health concerns and the residential air purification segment creating bankable opportunities at its nascent stage. Companies can consider investing in advertisements for growing their credibility and sales in the global air purification systems market.